I was playing around with the Red Heart Super Saver Blacklight yarn the other day. Have you used it? It's black and neon and super bright. It also makes an awesome argyle! 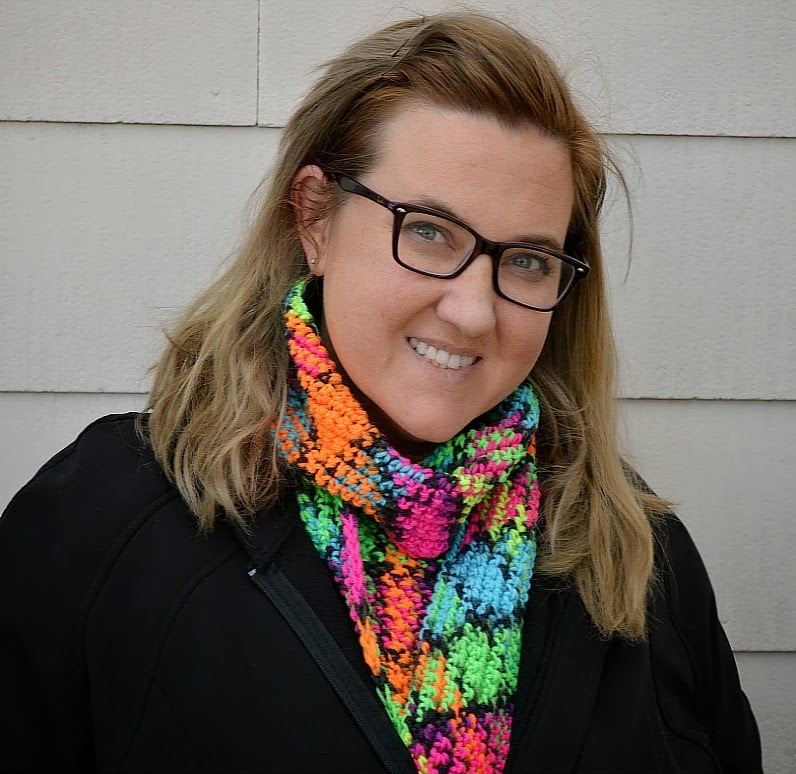 The repeat of the variegated pattern is very long (it reminds me of the Super Saver Camo yarns) but I used a larger hook and it turned out to be a great scarf length. So, for those of you that want to make a fun on-trend neon scarf with a little something extra (argyle!) I used a size I hook and my Argyle Crochet technique. Mine worked out to be 185 single crochet stitches long, and 17 rows. 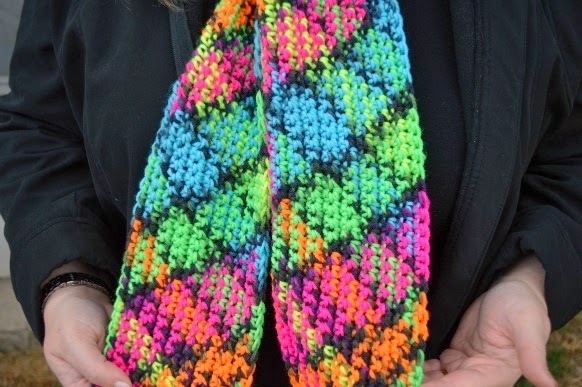 (You don't HAVE to use the argyle technique, it would still look cool as a variagated scarf). The finished scarf is approximately 63 inches long and 5 inches wide. Wow! That's beautiful! And it looks great on you! I can't wait to try it!!! Hi Jaime, What a beautiful scarf and it looks absolutely stunning with black!!! My daughter, Miss J, will love this scarf!!! Well done!!! Have a happy week!!! I have made this scarf and it does give that checkered pattern. BUT, I had to crochet the whole colorway (see the book), AND I had to constantly adjust my tension to get the colors to line up (moving one forward every row as rows alternate and cause the crossed pattern. Really, you won't see the change in tension in the finished product because your eye is drawn to the pattern. Thanks for this! I bought your book too. I was surprised how long the chain was at the beginning, but it all turned out pretty well. Definitely one to pay close attention to as you are working it. Tension is key. Ugh. I'm confused, I found this under " free patterns", but it links to Amazon? Where is the free pattern please?